The iCivics Educator Network is an energetic group of educational professionals who represent iCivics with outreach and training and, just as importantly, provide the organization with invaluable insights and guidance relating to the field, the profession, and the realities of the classroom. Below is an interview with one of our Education Network members. As a member of the iCivics’ Educator Network, how have you helped implement Justice O’Connor’s vision of restoring civic education in your classroom/district? Justice O'Connor's civics education clarion has led to a renaissance of civics education in the classroom. 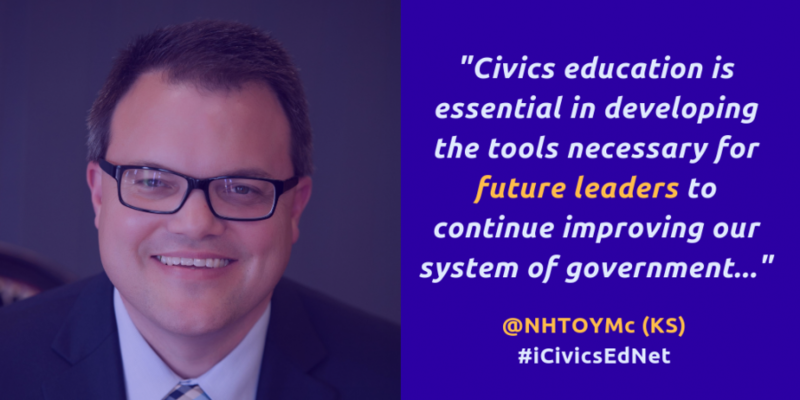 As part of this vision, I have instituted several changes to elevate and incorporate civics education into my classroom curriculum. My students have competed in an iCivics Do I Have a Right competition, going through several rounds of play. Students have learned the basics of local government through the game Counties Work. However, the greatest impact has come in the form of a blended iCivics/Election project. Through this project, students play Win the White House, take political quizzes, and register to vote. As a classroom teacher, I appreciate the ease with which iCivics resources can be implemented. By having students learn by playing civics-based games they are better able to process complex concepts and learn on a more personal level. Additionally, I have been able to take this civics gaming platform and introduce it to community organizations and educational colleagues through classroom professional workshops and conferences. Have you noticed that students tend to be more engaged when using iCivics resources? If so, why do you think that is? The reason for this is simple. The beauty of iCivics.org is the engaging and inviting platform. As a game-based learning platform students don't feel like they are being put on the spot. They are free to make mistakes and learn because that is what gaming is all about. How have you used iCivics’ to improve civic discourse in your classroom/district? Yes. When students understand the functions of government, by using the resources of iCivics, they are less apt to wildly speculate and are more grounded in their discussions. It's a confidence boost. So when we discuss gun control v. gun rights students clearly grasp and are more cognizant of the realities surrounding this passion-filled issue. How can educators use civic education to reverse students’ disillusionment with political processes? When students understand the process and are confident navigating the ends and outs of government they are less likely to become disillusioned and more likely to get involved. Using iCivics to help students understand these processes gives students the tools to combat ignorance with facts. How is civic education an important part of developing future leaders? Currently, in the United States, we are in a race. A race to educate a generation of students who must soon take the reigns of government. If these future leaders have no idea how basic functions of government work they will simply do what has always been, unable to make changes and the nation will slowly decay upon itself. Civics education is essential in developing the tools necessary for these future leaders to continue improving our system of government, never satisfied with the status quo. If you are interested in serving on the iCivics Educator Network or want more information, visit www.icivics.org/our-network. Follow #iCivicsEdNet on social media to see our members in action!